In theory, customer loyalty programs are a great way to retain customers and encourage them to come back to purchase the products and services of your companies and businesses. However, in practice, loyalty programs don’t always end up the way you envision. If you find that your program is sluggish or unsuccessful, don’t despair. 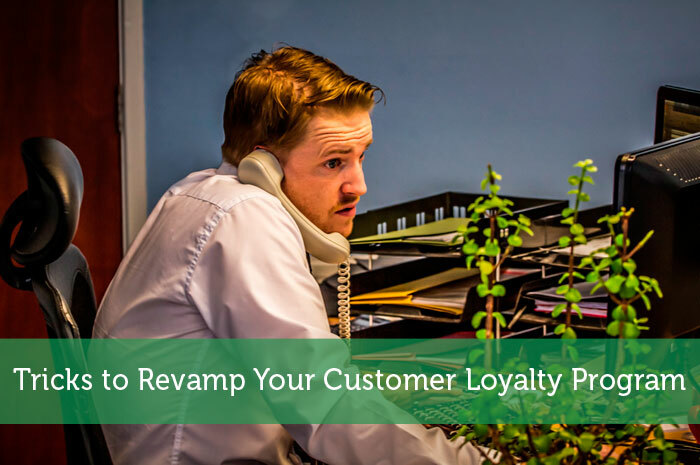 Your customer loyalty program is salvageable, and it can still be a major avenue of customer retention for your business. All it needs is a reevaluation and a facelift. Setting aside time to plan and make changes to your rewards program is well worth it, especially if you consider certain tips. To really get the most out of your rewards program, you need to know what your customers want. This helps you better plan your rewards. If you’re offering your customers a free t-shirt, but what they really want is a free cup of coffee, they have little incentive to achieve the reward. One of the best ways to determine what your customers want is to observe their buying habits. For example, according to the data from entertainment site Buzztime.com, 62% of restaurant patrons spend more money on food and drinks when they play their games. For restaurants and bars, this a simple way to increase sales and dwell time in their establishments. Knowing spending habits allows you to identify the most valuable commodity your business or company offers, and you can plan rewards around that. You can also take a direct route and simply ask your customers what would motivate them to use the loyalty program. Without proper promotion and marketing, your customer loyalty program will likely fizzle out. If customers don’t know that you have a rewards program, they won’t take advantage of it. To ensure that everyone knows, post signs around your business. Take advantage of your social media following and make references to it on your various accounts. Place advertisements for it in prominent spots on your website. You can also use the old-fashioned word-of-mouth technique and have your employees inform patrons about it. Be careful with your expectations. If you expect customers to make 25 purchases before they reach the first reward, you may lose customers. Your patrons may also become impatient with the long wait before they get a reward. One of the ways to remedy this is to set multiple reward levels. Customers who buy five meals get a small reward. Those who buy 10 earn a larger reward, and those who purchase 25 earn the largest reward. Decide what your customers do to earn their rewards. You could have a punch-card system, so customers can simply present their cards to keep track of their points and rewards. You could also set up an online rewards system that customers can use at any time. If your business has a mobile app, you could work your rewards program into it. However you decide to format your customer loyalty program, it needs to be convenient for your patrons, or they won’t want to use it. A rewards program can be an invaluable tool for your business, especially if it’s structured and planned well. While you brainstorm, try to troubleshoot ahead of time. Tackling difficult questions and situations beforehand makes implementing your program easier. When you make the decision to give your customer loyalty program a makeover, keep in mind that it may take a while for interest to catch on. However, with perseverance and patience, your rewards program should take off. Great roundup as usual, really enjoyed your article. Thanks for sharing your article about this Tricks to Revamp Your Customer Loyalty Program. I will definitely share this to my friends. Looking forward for your best article this year. Absolutely right. Creating a promotion or loyalty program is only half the battle. Publicizing your efforts is an even more important component that is often overlooked. If no one knows you have the program then essentially it doesn’t exist.